Our range of Dog Grooming Scissors includes many different types of scissors: straight scissors, thinning scissors, curved blade scissors etc. How to choose my Dog Grooming Scissors? If you're looking for professional dog grooming scissors, then you must know exactly what you will use them for. 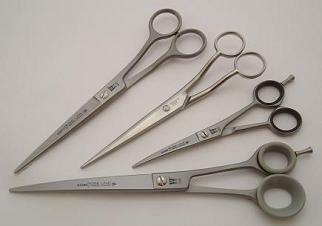 Straight scissors are the most commonly used scissors, but some users prefer rounded tip safety scissors for delicate areas. Need help deciding which dog grooming scissors to buy? Check out our guide to dog grooming scissors. Already bought the perfect scissors for you? Find out how to take the best care of your scissors for a longer product life! 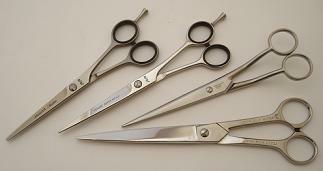 Roseline scissors are still one of the most popular and quality brands supplied by Diamond Edge. Shop for these high-quality German dog grooming scissors from AMA & Gotta. Buy Joewell dog grooming scissors - hand finished in Japanese steel for an exceptionally smooth feel. 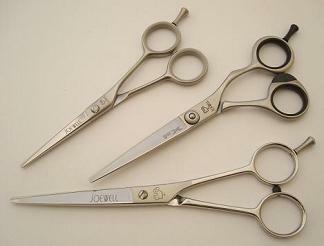 Jaguar scissors offer excellent quality at a reasonable price - shop now. 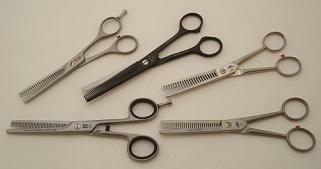 Top quality dog grooming scissors from these German manufacturers - shop now! Shop this range of trusted, quality scissors at an affordable price! 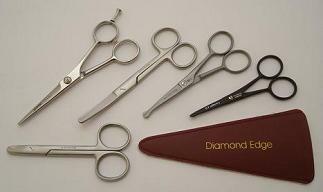 Shop an extensive range of thinning scissors - all of which can be sharpened by Diamond Edge! Shop for safety dog grooming scissors - for grooming those more delicate areas. 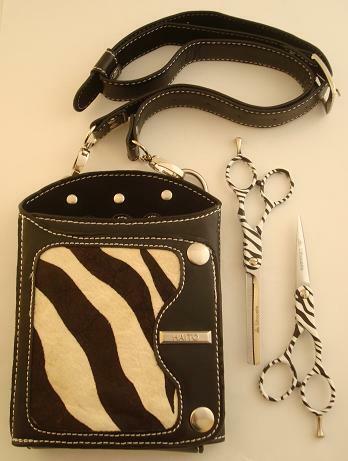 A range of pouches and holsters for your dog grooming scissors.